Last night I watched our video monitor in amazement while my three-year-old daughter, in bed for the night, rolled around with her stuffed animals singing, “We will … we will… ROCK YOU!” I kid you not. She was mimicking her six-year-old brother, who’s learning the song in his School of Rock class. If that doesn’t make a powerful statement about the timelessness of Queen’s music, I don’t know what would. I never considered myself a Queen “fan” per se. I like all of their songs, but going into Bohemian Rhapsody, I didn’t know much else about the band except for the fact that lead singer Freddie Mercury had died of AIDS in 1991, and American Idol runner-up Adam Lambert was now their frontman. The star of the film is by far Rami Malek (Mr. Robot, Papillon), who plays Mercury. I couldn’t take my eyes off of him, which seems to be the effect Mercury had on people in real life as well. Malek is virtually a shoo-in for a Best Actor Oscar nomination because of his complete transformation. His performance alone makes this movie worth seeing. Mercury was a one-of-a-kind entertainer both on-stage and off, and therefore you will be entertained. Rhapsody briefly covers Mercury’s childhood and college years and how he came to be in Queen, but it mostly focuses on the band’s hits, their rise to fame and Mercury’s complicated private life, culminating in a rousing reenactment of Queen’s epic, world-renowned Live Aid set in 1985. If my praise of Malek’s performance didn’t hook you, then perhaps the music will. There are just So. Many. Hits crammed in before the soaring finale, from anthems like “We are the Champions,” to the bass-driven “Another One Bites the Dust,” to the genre-defying song that doubles as the film’s title. If you don’t enjoy the music scenes, you might be dead. I wish, however, that controversial director Bryan Singer (who was fired before filming ended and replaced by Dexter Fletcher in the final weeks of shooting) had gone deeper into how the band came up with each song and how their relationships evolved over time. A perfect example is when we see the band fight with a record executive over the release of “Bohemian Rhapsody” as a single — the executive (Mike Myers, who was horribly miscast, as he was a huge distraction for anyone familiar with a certain late-‘80s/early-‘90s Saturday Night Live skit and its connection to the song) thinks it’s too long and too weird for radio play. Mercury ultimately defies him and finds a way to get the song on the air, but the audience is left wondering if he suffered any consequences for doing so and exactly how the song took off after that. Rhapsody is more of a “this happened, and then this happened, and then this happened” type of biopic — even though a good chunk of what was depicted didn’t actually happen in the order shown. Why Singer made such decisions, we’ll never know. So while I was certainly never bored, I wanted more. 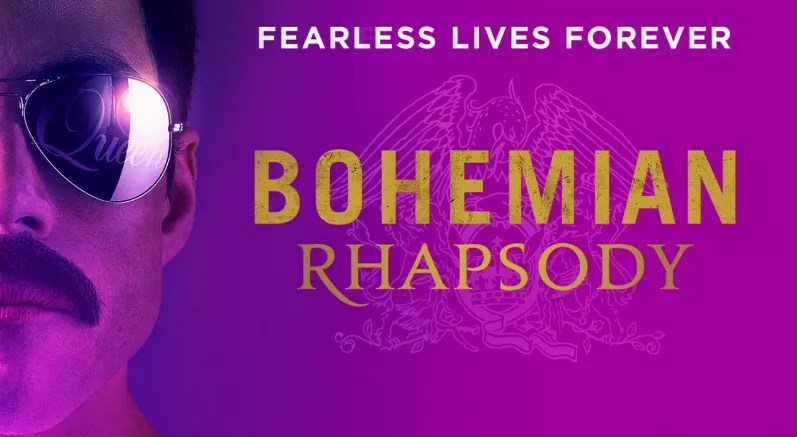 Still, Bohemian Rhapsody is a rousing look at Mercury’s road to superstardom and Queen’s legacy of song, and unless you are a Queen superfan who goes into it hoping to learn something you didn’t already know, I think you’ll walk out of the theater stomping and clapping like Freddie would’ve wanted.